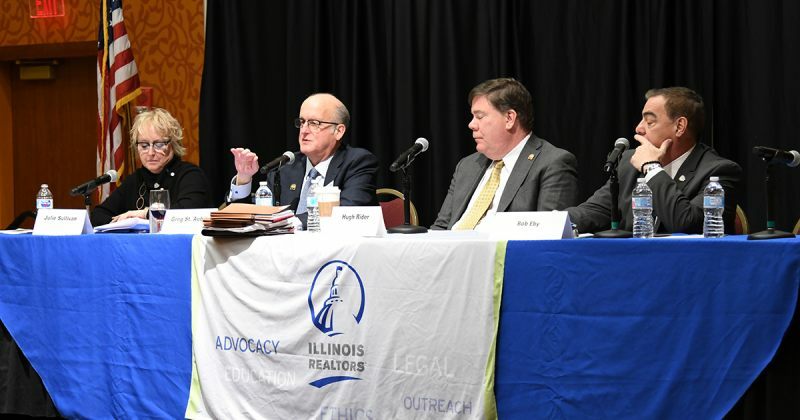 The spring legislative session in Springfield is shaping up to be a busy one with rent control, taxes, condo fees, home rule powers and more on the possible agenda, said Greg St. Aubin, Illinois REALTORS® Senior Vice President of Governmental Affairs. The political landscape in Illinois has changed in the last year. Democrats now control the governor’s office, all state constitutional offices and have super majorities in both the Illinois House and Senate. That means power over the political agenda, but also responsibility with the outcome – both good and bad, St. Aubin said during the Public Policy and Governmental Affairs Member Involvement Group meeting in East Peoria Thursday. Right now the feeling in Springfield is one of cautious optimism, he said. Key to the industry’s legislative success will be the bipartisan relationships and respect REALTORS® have established with state lawmakers over the years, St. Aubin said. But with 50 new lawmakers in the Illinois General Assembly this session, REALTORS® will be working to inform them of issue affecting real estate. St. Aubin and Julie Sullivan, senior director of Legislative & Political Affairs, outlined some of the top legislative issues to watch this spring. Rent control – REALTORS® are opposed to price controls on rental property and will be advocating against efforts that would allow rent control measures in Illinois. Sales tax options to fund local pensions – Some municipalities are beginning to look at the option of using sales taxes to alleviate municipal pension debt. Graduated income tax – Illinois is one of few states with a flat income tax rate. Look for discussions of a graduated tax system. Local government consolidation – Illinois residents want property tax relief and one way to do that would be to consolidate and eliminate unneeded layers of local government. Illinois REALTORS® can stay up to date on these and other legislative issues this spring at www.IllinoisRealtors.org/Advocacy and with the State Capitol Report (member login required).